The building is part of a cross-institutional, integrated urban campus for biomedical education and research, developed through a partnership between the University of Arizona, College of Medicine-Phoenix and Northern Arizona University. It consists of administration and faculty offices, many lecture spaces, clinical skill and simulation suites, large anatomy facilities, and student amenities and a cafeteria. The Arizona desert climate, with high summer temperatures and an abundance of solar irradiation, leads to cooling dominated buildings. The need for reduced energy consumption informs much of the design for HSEB. The building’s form and façade design was optimized to reduce solar gains while maximizing access to daylight for indoor spaces and to create a visual connection to the outdoors. Frequent storms demanded a robust shading systems and despite the desert climate the client asked for high comfort outdoor spaces. The facility is divided into two academic wings with north-south orientation, closely sited to each other to create the building’s central organizing element known as “The Canyon.” This key feature minimizes solar exposure and maximizes self-shading, allowing light from, and visual connection to, the exterior. In the canyon, there are more glazed openings at the lower level with fewer windows near the top of the building. Natural light is harnessed to flood the lower portions of the canyon with light. The canyon is clad in light-colored, burnished concrete block to provide cool thermal mass and reflectivity. At the top of the canyon a PTFE scrim roof helps regulate sunlight penetration. The exhaust air from the mechanically ventilated buildings transfers into the canyon and sinks to floor level due to convection, which helps cool the outdoor occupant space. The south-facing façades combine overhangs with perforated screens that function as sunshades; Vertical fins control sun penetration on the north side. Spaces are solely daylit through the North and South façade; East and west facades are opaque, as they are difficult to shade with fixed elements. Transsolar developed a comfort and climate concept and supported the form shaping to optimize sun protection and daylight use. 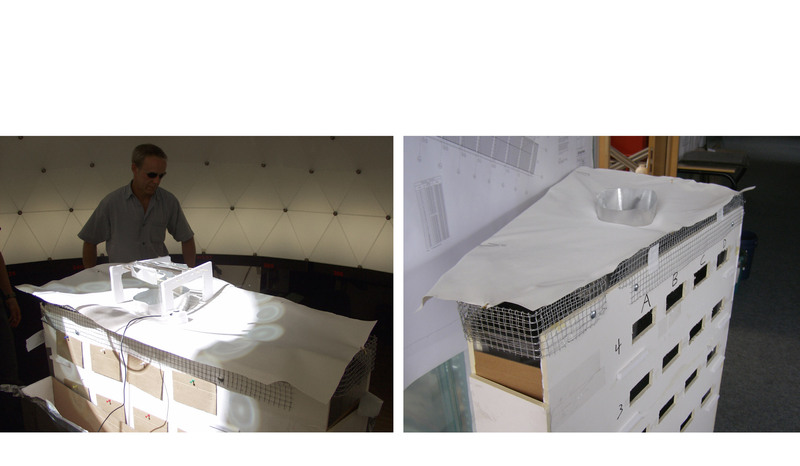 Therefore Transsolar performed complex daylight simulations and model tests in the light laboratory.